It sounds counterintuitive, but the harder you yank on the brakes, the less control you have over your bike. The best riders brake well before a corner. Plus, laying off the stoppers forces you to focus on key bike cornering skills such as weight distribution, body position, and line choice. “When riding a tricky or dangerous section of trail (or road), focus on the path you want your bike to follow, not the rock, tree, or other obstacle you’re trying to avoid,” says globe-trotting mountain-biker Hans Rey. “For God’s sake, make sure your hair is under your helmet and not poking out the front,” advises Garmin-Cervelo pro Christian Vande Velde. You have a right to the road, so use it. It’s safer than riding on the shoulder, which is often cracked, covered in gravel, or worse. But don’t be a road hog, either. 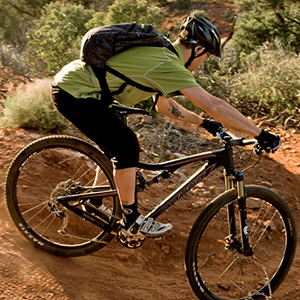 It’s frightening how many riders hit the trail with poorly adjusted forks and shocks. Not only will droopy suspension make your bike feel like a wet noodle, it can also be downright dangerous. A few simple adjustments are all it takes to have your suspension smoothly sucking up bumps. Here are some general guidelines, but be sure to read the manufacturer’s recommendations (found online or in your owner’s manual) because they will provide the starting point based on your bike’s suspension design. And because air can leak through the seals, remember to check your pressure monthly. set sag, visit Bicycling.com/video. Start with the dial in the middle setting, and go ride. If the bike feels harsh, dial the damping down a click. If it feels mushy, add a click. Repeat until it feels smooth and supple. Again, start in the middle setting. Ride a short, rough section of trail. If the fork or shock seems too springy, add a click of rebound. If it bounces back too slowly, dial it back a click. A slow start primes your engine by directing oxygen from your blood cells to your muscles. Spin easy for 20 to 30 minutes before you begin to hammer. Money can’t buy love, but it can buy food, water, a phone call, or a spare tube. It will push you to ride harder than you previously thought possible. 13. Eat Real Food On longer rides, easily digestible calories are key—and they shouldn’t come from just energy bars. James Herrera, MS, founder of Performance Driven Coaching, has a favorite: spread some almond butter on whole-grain bread and top with sliced bananas and agave nectar or honey. When the shoes come off, your shorts should come off with them. Take 56-year-old mountain-bike legend Ned Overend’s advice: Rest often. And if you’re feeling cooked after a 30-minute warm-up, put it in an easy gear and spin home. “No workout is set in stone,” Overend says. “Your training needs to have structure, but it should be malleable based on how you’re feeling.” Which might explain why, 10 days before he won the 2011 Mt. Washington Hill Climb, Overend was surfing in San Diego. Go hard on climbs and take it easy on descents. Explore the woods on a mountain bike. Throw down in the local cyclocross race. Mixing in different types of riding keeps you mentally fresh, boosts your skills, and reminds you that riding is fun. You have lots of gears for a reason: to keep your cadence in the sweet spot. For silky-smooth gear changes, remember to shift before a punchy climb, sprint, or tight switchback. Here are some basic guidelines from Michelin. This is mandatory for carbon parts, but will also extend the life of all stems, handlebars, bottom brackets, seatpost clamps, and suspension pivots. Our favorite is Park’s TW-5. Doing an unclipped hop shows you how changes in body position affect your bike’s behavior—knowledge that will boost your confidence on steep downhills, rough roads, and in corners.